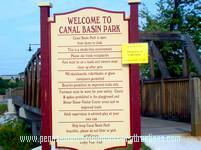 The Play Area of this Historical PA Canal Basin Park is a custom designed play structure replicating a Sectional Canal Boat. The Sectional Boats were designed and built by Captain John Dougherty in Hollidaysburg during the Historical Blair County Canal Era. The Steam Engine, which pulled the barges up the incline, is located in the park. Explore Pennsylvania History through the trails at Blair County's Canal Basin Park, the unique play structure is one of a kind designed solely for this Pennsylvania Park. The Hollidaysburg, PA area is one of the oldest Historic Central Pennsylvania Attractions. Enjoy learning Pennsylvania History using 3 interactive computer generated programs at Canal Basin Park's Visitors Center. A model and a mural depict Hollidaysburg, PA in 1854. In 1834 the railroad and the canal had come through the area. Hollidaysburg went from a population of 72 in 1830 to a population of 3,000. All because of this National Historic Landmark. The Historical Pennsylvania Canal Basin Park Visitors Center is located in a restored house from the Victorian period known as the Reiser House. The Visitors Center is located at the site where the Lock Tender's House stood during the Canal Period. Visitors have to option to visit and relax in the Tearoom while visiting the park. 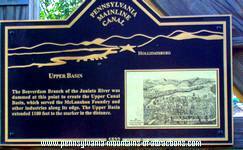 Pennsylvania started digging canals in 1825 and had more miles of canals than any other state. The Allegheny Portage Railroad connected the canal system on both sides of the Allegheny Ridge. Irish Immigrants dug the canals by hand with a pick and shovel, wheelbarrows, and black powder. They also used horse-pulled drag lines and dump wagons. They were paid with tools, board, and drink. Many Irish lives were lost due to strenuous work, meager living conditions, and disease. Their hard work began the industrial revolution and opened the Northwest Territory. Building the Blair County Historical Pennsylvania Canal Basin was a four-step process. First, the workers cleared stumps and trees from the site. Second, they dug the path of the canal. Third, they placed a mixture of gravel and clay called puddle on the canal bed to prevent water leakage. Then they would line the walls with cut stone. Finally, they filled the canal with water from the nearby river. Locks were built and occurred wherever land rose and fell more than 8 feet. The PA Canal Basin lock gates were "v" shaped with the "v" facing up stream. The gates were opened and closed manually using a balance beam operated from the shore by the lock tender. Many lock tenders were Civil War Veterans. The boaters blew their horns to warn the lock tenders of their approach. The Canal Basin boating season was from March 10 until Christmas. Passenger boats traveled 80-100 miles per day. Freight boats traveled 25-45 miles per day. The space available on the passenger boats for passengers were an area that was 6 feet high and 10 feet long. The boat itself was 72 feet long, 11 feet wide and 8 feet high. The boat had 4 sections, a mule stable, a kitchen, a gentleman's quarters, and ladies quarters. The boats carried a total of 150 passengers. The crew consisted of a captain, 2 drivers, 2 deckhands, 1 cook, and 1 scullion. A team of either horses or mules pulled the boats through the canal. There were often two sets of teams. One team would rest on the boat while the other worked. Captain John Dougherty invented the Sectional boats in Hollidaysburg, PA. The boats were bolted together and could be taken apart and hauled section by section using the railway. This saved money, time, and increased the profit margin. There were many famous people that traveled through this National Historic Landmark Canal Basin, author Harriet Beecher Stowe, Phillip Nicklin, (a.k.a. Perregrine Prolix) and Charles Dickens are listed, just to name a few. The Park is opened from April 2 to December 20. While you're in the Blair County area why not stop by the Historic U.S. Hotel it's a Historic Landmark where you can enjoy a fabulous dinner! This Pennsylvania Historical Tavern has as much Pennsylvania History as the Canal Basin. Captain John Dougherty built this famous tavern in 1835, many of the original fixtures are still in tack. You can read about the Historic U.S. Hotel and it's famous haunted attractions by following the link. Take a tour of the famous Historic Baker Mansion. Built in Altoona, PA, in 1849. It is now the home of The Blair County Historical Society. While your in the area stop and fill up your gas tank at America's Oldest Gasoline Station and get unique service rarely seen today. This Strange Pennsylvania historical landmark has historic ties to the Baker Family.